Here is some news on the new Hasbro contest. Thanks to everyone who sent in news about it. On the back of the figures (now appearing in stores across the country) you find a blue post card that is stuck on. You can enter the contest by filling out the postcard and sending it in to Hasbro. But there is an age limit, you have to be between 4-12. There are to be 4 grand prize winners with 600 additional winners. When you send in the postcard you can become a member of the JediQuest, and you get a subscription to Commlink, which is possbily a newsletter Hasbro is putting out. Crazy stuff here…. go to Rebelscum.com to read more about this find and see the pic. The new 12″ Obi-Wan, Watto and Battle Droid figs are now starting to show up at Target. Thanks to Matt for the news. Scott has more of these to sell, You can get the Naboo fighter $10.00 or a set of figures and the Fighter for $80 plus shipping. If you have ordered a set already email me and we will include the naboo fighter. The Insider Magazine and Star Wars Kids Magazine trivia giveaway starts on Sept. 1st, 1999 here at Yakface.com! I just wanted to let everyone know that EB is starting to get these for $21.99. I have seen them in three EB’s in my area (Southern NH & Northeastern MA). They have also have the new Han wave, although, I haven’t seen an R2D2 with holographic Leia. Several reports of the newly released Anakin Skywalker (Naboo) have been sent in. They are showing up all over the country along with the Han/Gonk POTF2 figures en mass. Most sightings are of multiple cases of these figures being found. Hasbro’s Executive Vice President and Chief Financial Officer John T O’Neill will retire at the end of the year. The resignation comes as Hasbro tries to allay concerns that sales of its newest line of SW action figures and vehicles haven’t been as robust as expected. To fill John O’Neill’s shoes, Hasbro has announced that David Hargreaves, Sr. VP of Finance has been promoted to Deputy Chief Financial Officer. Hasbro’s stock is down 27 percent since May 3, the date that the SW products were introduced. This info from Bloomberg News & Theforce.net. The official Star Wars site has updated with a few new things. First a new snapshot of a Naboo Pilot during a space battle. Second, an interactive feature about Podracers and what makes them tick. Third is an article about “The Magic of Myth” returning to the U.S. Here is an excerpt: “Beginning this fall, people across the nation will have the opportunity to view one of the most visited Smithsonian exhibitions of all time. “Star Wars: The Magic of Myth” begins an American tour at the San Diego Museum of Art on September 25, 1999, and will be on view in San Diego through January 2, 2000. ” Check out the official site to check out all these new features! If you are interested in making custom Star Wars figures, then head on over to the Sarlacc Pit. The site now has very detailed articles on customizing Star Wars figures. From sculpting to molding, his articles cover the bases in detail and with tons of photographs! While you are there, check out his awesome customs! Sure would be nice to have these in some three packs eh? [hint hint hasbro ears….] Also wouldn’t it be cool to have IG-88 carded? just a thought…..
Rebelscum.com has pics of two versions of the new Jawa that comes with the Gonk droid. One has holes in the bottom of his feet ones does not- stop on over to see for yourself. The official site has updated once again with an article on the record breaking openings of Episode 1 in Sweden, Denmark, Germany, Austria, Norway and Spain. Episode 1’s next international opening takes place today in Switzerland. Also a new snapshot has been posted, Queen Amidala’s ship docks on Coruscant. According to a recent interview with Episode 1 producer Rick McCallum, The Star Wars trilogy may not be released on DVD at all! It appears Lucas is waiting for a new format to come out in a year or two called HD-DVD (High Definition DVD). This means a lot more storage compacity and higher resolutions. McCallum also talks about how the Indiana Jones trilogy will be re-released on VHS and Laserdisc this year in Widescreen formats but not on DVD (Talk about backwards). Check out the DVDFilefor the full rundown and a great editorial on the issue. Anakin Naboo is showing up here in Central PA at Wal-Marts. So are the Epic Force Obi Wan and Darth Maul figures. Thanks to Darth Celt for sending in the news! Where I live in N.J. there’s a bunch of new die-cast and micro machine toys by galoob at the local walmart in Roxbury N.J.. I picked up the Sith Infiltrator (AWESOME!) and I saw a Trade Federation battle tank (I think that’s what it’s called) and Sebulba’s pod racer for sale for about $6. There could be more available, but those were the one’s I saw. All of them were die-cast metal and very detailed. Also I saw some new micromachine two-packs. I can’t quite remember exact combintations, but there was a mini- Darth Maul figure with another Maul on a Speeder; Rune Haako with a land speeder; naboo starfighter with a pilot. There’s more obviously, but I just wanted to let you know. Again, I don’t know if this is new info, but the infiltrator is GREAT!!!! They just need to make a big one for the Hasbro line. Thanks to Matt for the news! Disney is curently remodeling the store, and it is currently closed. An employee told me they’re shooting for a mid-September reopening. Thanks to Tom for the news! Episode one has made 418 mil in the U.S. and 689 mil worldwide! Parkwars.com is the place to download the south park styled Episode 1 trailers. Very funny stuff! Happy Birthday to Kenny Baker! Kenny Baker, the man who has brought R2-D2 to life for all of us turns 65 today! Happy Birthday Kenny! Looking at the scan of the box (see story below), you may be wondering why a Battle Droid figure is packaged with the playset when there were no Battle Droids at all during the lightsaber duel. This comment from Kurt may clear everything up: “I just purchased the Episode I Insider’s Guide CD-ROM (great piece) and when you read the commentary for the saber duel between Maul and Obi-Wan, it says that in the original script Obi-Wan fought off BattleDroids before slicing Maul in half (rather than jumping up from the melting pit the way he did in the final draft and film). I wonder if this is another case of getting the toy done before the movie?” Probably is, or Hasbro decided to throw in a cheap Battle Droid to give more play value to the playset. New developments in the Missing R2-D2 w/ hologram Leia story have come in (see story below). I recieved a couple reports from people who ordered a couple cases from online stores and they contained the R2 figure. In contrast, a few more reports of people opening the cases in stores and finding no R2 figure have come in. My only guess is that there are currently two different assortments shipping. One without R2 and one with R2. On another sidenote, apparantly the Jawa w/ Gonk figure is not pictured on the backs of the new figures, but the R2-D2 with hologram Leia is. Episode 1 for PSX Goes Gold! Lucasarts has announced that “Star Wars Episode 1: The Phantom Menace” for the playstation game console has gone gold, which means the game is finished and is now being manufactured for a September release date. The game will be just like the PC version with the same name. Philip over at rebelscum.com reports that the Battle Droid included with the Theed Generator playset is the same that is included in the overseas two-packs. Which means less articulation, paint and a molded gun onto the hands. I meant to post these a long time ago but never got around to it. Anyway, check out the links below to see images of the name badges worn by cashiers and managers. These are probably some of my favorate pieces in my collection. This info we posted is incorrect. I have heard from Jen that the site will be up soon. Please be patient! “(incorrect info)Thanks to Carlos for lettin us know what a Hasbro Comsumer Rep e-mailed him back when he asked them a few questions. Mark sent in an interesting report where he opened a sealed case of POTF2 figures at Wal*Mart. “I opened the sealed case, there were no R2D2 w/ Holographic Leia! The case had 3 Hans, 3 Luke w/skyhopper, 3 Greedo and 3 Jawa w/Gonk, but no R2D2 w/Leia.” I don’t think he is missing, I am pretty sure he is scheduled to come out with Darth Vader w/ Interrogator droid, New Stormtrooper, etc. in September. Correct me if I am wrong. Jedeyeben has sent in a scan of the box for the newly released Theed Generator Complex with exclusive Battle Droid figure. Thanks for the image! The Official Star Wars site has updated with news on the release of the new Star Wars Insider magazine. Highlights from the magazine include an interview with Ahmed Best (Jar Jar), Rick McCallum’s Prequel Update, A look back at the summer of Star Wars, and two different covers. Click here to read the article. Also a new snapshot of a model from the Theed Palace miniature has been posted. MosEspa.com is having a summer sale! 100 items are now up to 70% off! Visit the site for more details! PB200 wrote in to us that they have started showing up in Wal-Marts. TRU Online has the Darth Maul Tatooine and Electronic Maul for sale. I guess we will all have to wait and see 🙂 Click here to compare. Here are some more new items that have recently been released. Thanks to everyone who sent in the news. Since there has been a lot of new products showing up this past week I thought i’d post a short rundown of what is out and where so far they have been found. Click here! if you missed yesterday’s post. Wow! Someone likes JarJar! Check it out here! Thanks to Jim Abell from “The Inner Circle” for pointing this out! Apparently when Hasbro had their site up many people went a snoopin’ for new pics… well these two were both up there… the difference in the new Droideka seems to be battle damage! Check the comparison here! TRU now has this in stock. Check out the email that was sent to James. Dear Darth Maul Fan: The Electronic Darth Maul 12 inch Action Figure has just arrived in our warehouse. We are notifying you about this product first, as you expressed interest in a similar item. Thanks to Jake for the news. It appears the Han Wave has hit in Iowa at Walmart. Jon sent in some nice detailed scans of the recently released 12″ Anakin Skywalker and Watto dolls. Click on the links below to check out the scans. Just a quick tip for all you eBay bidders, before bidding on a item be sure to check the sellers eBay Feedback rating! This could be done by clicking on the number that is next to the sellers username. There have already been a few people ripped off because the seller was a crook! Some new info was released during the recent San Diego Comic Con. Looks like you will have to wait awhile to get Star Wars on DVD, Lucas still plans on releasing all 6 movies as a DVD box set after Episode III comes out in 2005. The DVDs are supposed to be the best Lucasfilm can do and look for them to be chock full of extras such as the cut scenes from “A New Hope”. On the brighter side, the Episode 1 VHS release will probably be Spring 2000. Here is the Case assortment for Adi Gallia. Adi Gallia in Stores NOW! Adi Gallia has started to show up in stores across the country. So far it has only been reportd found at Wal-Mart and TRU. Here are some nice detailed scans of the new Adi Gallia figure. Here are some nice detailed scans of the new Epic Force Darth Maul. AAT and Faamba OUT NOW! The remote controlled AAT and Faamba from Galoob are both now showing up in stores. Both are selling for about $17.99. Thanks to Mr. Quint for the news. Ep I Epic Force OUT NOW! We’ve recieved reports of the Epic Force Darth Maul and Obi Wan showing up in stores in the US. Also, Rebelscum is reporting the case breakdown is 3 Maul’s and 3 OB-1’s. Topps Hobby Edition Series Two out now! 6″ Ep I Figs OUT! Here is a pic of Anakin & R2-A6; thanks to Dan for the pic and news. Dean has sent in some pics of the replacement gold Yoda can being sent to people who sent in the can in exchange for a replacement can and a $20 check. There are some differences between the store version can and the mail-away can. Check out the scans below. Thanks to Dean for the news and pic. Here is a pic of the check you get for the Gold Yoda can. Here is the phrase the Pepsi cans make in case you haven’t figured it out. “Anakin breaks free but may face new enslavement, the Jedi triumph but their future is clouded, one menace is destroyed but another lurks nearby.” Thanks to Tony for the news. Just trying to head off the rumors. There is a rumor that the Ki-Adi has an error on the card. The rumor is that there is a misprint that it reads that Ki-Adi is a Jedi Knight, not a Jedi Master. This is not an error, he is the only Jedi Knight that serves on the council. Do not be taken in on this, do not pay more money for it. Here are the words to the Pepsi cans, see if you can figur out what the sentence is. “new, lurks, breaks, but, their, face, but, enslavement, destroyed, future, may, another, anakin, is, free, jedi, but, nearby, is, triumph, menace, the, clouded, one” They are in order from can 1 to 24. Thanks to Ryo for the news. Well it had to happen sooner or later. TPM is now at #11 out of the top ten for the first time since its release. Here are some detail pics of the new Rebel Pilots 3 pack. Issue #5 on sale now at MosEspa.com. This magazine is aimed at kids 7-12 years of age. You can get the most recent now. Remember that we will be having a trivia contest starting Sept. 1, 1999 to win 1 of 20 subscriptions right here at YakFace’s Realm. They look just like the Anakin #1 Pepsi can, except they don’t have the nutritional info. The deal is you buy a Pepsi 12-pack and you get the canister for $4.99. The canister is 8 inches high and 5 across. On the lid it has TRU and Cracker Jack logos. Inside it has a small bag of Cracker Jacks, an Anakin mouse pad (he has on his podrace helmet and the podracer is in the background), and 2 coupons. One is for 20% off any one Kids R Us item, and the other is for $5 off any $25 TRU purchase (it pays for itself). There seems to be a problem with people getting tricked into believing the “Defeated Darth Maul” is a real figure. It is NOT A REAL FIGURE, it is a custom figure. There was an article in a magzine called Toyfare last month on how to make this figure and how to place it into stores to trick people. Do not be fooled into buying this figure, unless you want a custom figure. Hey all, I got my Fan Club Denver passes in the mail yesterday and was wondering if anyone else got this extra cool pass in their set? Hunter ESB found the Episode 1 Action Fleet Wave 2 at a local Target in Southern California. The wave consists of Anakin’s Pod, Droid Starfighter, Trade Federation Landing Ship, Gungan Sub, Mars Guo’s Pod, and Flash Speeder. Check out his picture of all of them. Toys of America is now taking credit-card preorders for the Interactive Yoda toy (Furby Yoda). You can visit the website or call (416) 746-7825. Here are some nice scans of the new Jabba the Hutt Ep I beast. Thanks to Darksith for the pics. Jabba the Hutt OUT NOW! The Ep I Jabba the Hutt beast pack is now showing up at Wal-marts across the country. Thanks to everyone who wrote in about it. bigv wrote in to say that he found the 12″ Electronic Darth Maul figure at his local K-Mart for a low $12.99! Check your local stores to see if this is a widespread incodent! ActionAce now has some old orange and green POTF2 carded figures, plus Qui-Gon (Naboo), Obi-Wan (Naboo), and Amidala (Coruscant). Thanks to Gasgano for the news. MosEspa.com now has the Rebel Pilots Cinema Scene available for $23.95 + S&H. Here are some detail pics of the upcoming Tatooine Showdown 3 pack. Thanks to Darth Bob for the pics. “If you buy something at etoys for 10.00 and find it cheaper for say 9.00 – Etoys would refund you 1.10 (1.00 difference plus 10 % = 1.10)” Thanks to massaua for wording it properly this time. Here ya go folks. Tons of pics (carded and loose) of the upcoming “classic” Han Solo wave. Thanks to Darth Bob for the pics. Catherine wrote in to say that eToys.com has a refund policy that goes a little something like this: “if you find the same product in a retail store for a lower price, they’ll refund you 110% of your money.” Now this sounds a little too good to be true, so be sure to check the site before taking advantage of this offer. The Galaxy’s Most Wanted now has a poll for an Amanaman figure. Check it out and vote! The Realm is VERY pleased to announce that we have been able to make this happen. The Star Wars Insider and Yakface.com have teamed up. We are going to hold a trivia contest to give away memberships here at the Realm. We are going to run 2 contests, the first is for everyone from the age of 13 and up. There will be a 10 question quiz, and a random drawing from all the correct responses, we will choose 20 names to give away a subscription to the Insider. The other contest will be for Children 12 and under, again, there will be a trivia contest with the same results, although they will get a subcription to Star Wars kids. These memberships are courtesy of Dan Madsen and the Insider. More news to follow, so spread the word. 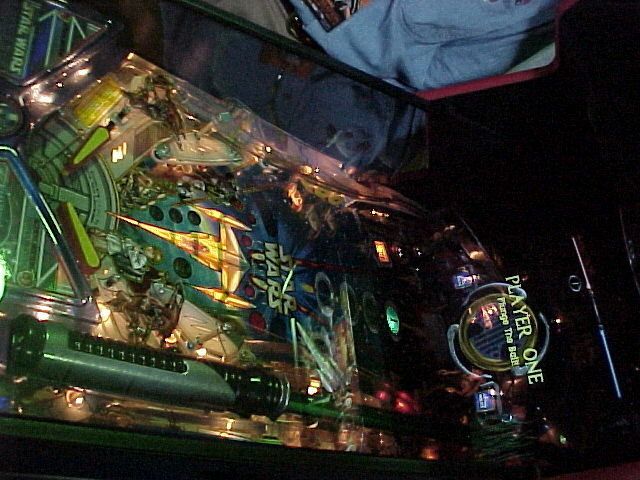 The contest will begin on September 1, 1999. We have opened the Toy Guide up, Episode 1 Action figures have been posted. Please feel free to look around. If there is something you would like to see in the figure section that we missed, please feel free to email me. Thanks to George for the news. Entertainment Earth has Wave 20 (69570J, SW Fig. Asst. Coll. 1 Wave 20, $114.99) IN STOCK. This assortment contains 2x Mon Mothma, 2x Chewbacca as Boushh’s Bounty, 2x Lobot, 2x Orrimaarko (Prune Face), 1x Princess Leia (all new likeness), 1x Blastshield Luke, 1x R2-D2 with datalink tools, 1x pull-apart C-3P0, 1x Leia Ewok Celebration, 1x Bespin Luke, 1x Bespin Han Solo, 1x Luke Ceremonial Outfit all on Freeze Frame Action Slide cards. The Outer Rim has pics of Super Deformed Ep I figs (non-windup). New Episode 1 Toys Released! Electronic 12″ Qui-Gon Jinn and Jar Jar Binks have been spotted at a Toys ‘R’ Us in Milwaukee, Wisconsin. All three Episode 1 12″ electronic dolls are now out! Thanks to “jbeardsley” for the info. Brian has posted a couple scans of the Denver Celebration Passes being sold at mosespa.com. Click below to check them out! Reports of the Rebel Pilots 3 pack showing up in the US are now startng to come in. So far it has only been found at Shopko, just like the Skiff Guards when they first came out. There are no differences in the passes being sold at Mos Espa then the ones given out at the event. This is confirmed by a fan club representative. Thanks to Grant for the news. **note from dlr- yes there is a difference. On the back there is a small line of text that says somthing about a reproduction, The originals at the denver show had nothing on the back. Rebelscum has posted pics of Panaka and the Naboo Trooper carded. check it out. There is a variation on the packaging for the Electronic Darth Maul. Some have a sticker warning label and some have it printed on. Thanks to Brandon for the news. Alright! Rebelscum.com posted card scans of Gonk with Jawa, Super-Articulated Stormtrooper, and Darth Vader with Interrogation Droid. Figures in Action has opened their doors officially and want you to stop on by to check ’em out. Mr. Anonymous stopped by again and let us know that the “foreign release mini figs will be available through the Hasbro internet eventually as a set. Included will be the mini naboo fighter with anakin.” No word on when though. And after a week of suspense, someone finally posted a picture of the 25th Star Wars Can – Destiny. Check out this site to see a scan of the store display that shows what the can looks like. 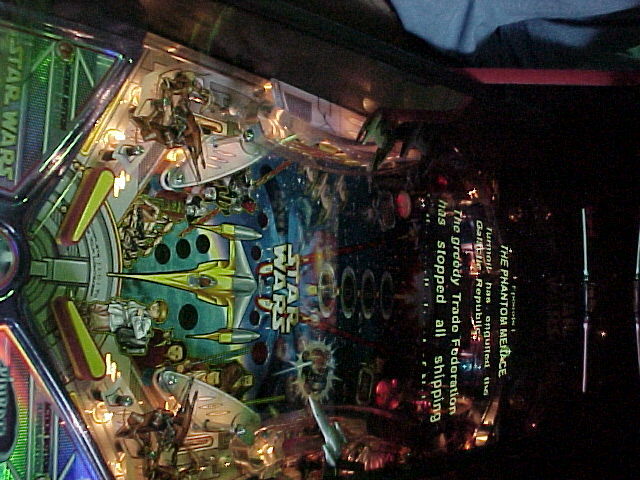 Here are some pics of the upcoming Ep I pinball game. Thanks to Dan for the pics. A while back we posted info about software called Dave’s Collector’s Companion. It is great software that keeps track of your Star Wars collection and it has a lot of great features. He has now completed the final version and you can download a free demo athttp://www.caseclosedgame.com/collector/. If you buy it, tell ’em yakface.com sent you! He has now been spotted at KB Toys for the hefty price of $37 plus tax. The scene where R2 falls off the landing platform and uses his jets to save himself is the latest snapshot at www.starwars.com so stop by and check it out. Thanks to Mike for the tip. If you collect these, you can check out Decipher for the latest release dates for the remaining 2 expansion sets. Thanks to Chris for the tip. The new 12″ wave (ob-1, battle droid and watto) is out. And showing up so far only at FAO around the country. On sale at Service Merchandise. Only $35. This may not be at all stores. According to Rebelscum the Mos Espa Encounter is now available to order at Entertainment Earth. The Phantom Menace earned 21.6 Million (2.55 billion yen) in its first week. Here are the US totals. The Mos Espa Encounter 3 pack (Jar-Jar, Sebubla and Anakin) has been found at Wal-mart in FL, CA and PA.
12″ Elec Darth Maul OUT! The 12″ Electronic Darth Maul has started to show up at Wal-mart for $29.96 a piece. So far it has been found in Indiana, Iowa and Illinois. Theforce.net has posted a scan of the check being mailed out to people in Canada who found the gold Yoda can and sent it in. Okay, sorry about being out of the updating loop latley, but today I saw a display at my local Wal-Mart. It had that Pepsi Star Wars Alien (forgot how to spell his name) and it pictured a new, never-before-seen Star Wars can. It’s full color, not the usual black, white, and gray cans, and it has Anakin in the foreground with Darth Vader in the backround. There was a paragraph that talked about Anakin’s destiny, but I didn’t have time to read it, and the gray plate where the characters names go it said something like “Limited Edition: Destiny.” I can’t find anyone who knows about this can, and I’m wondering if it’s like the randomly inserted Yoda can, or will it be sold in mass as basically a final can? Does anyone know? E-mail me if you do. Thanks. It turns out the only Ep I figures being recalled by Hasbro are Padme, Ric Olie, Chancellor Valorum, and Senator Palpatine. Thanks to Chris the KB manager for the info. If you have an email account set up with our free email system here you must realize that your email address is “yourname”@yakfacesrealm.com not YAKFACE.COM. We have been recieving emails from ebay from people trying to register accounts with them. If you type in “yourname”@yakface.com it just forwards to the webmaster here at the realm. Please make note of this. Outer Rim has pics of the Mos Espa Encounter 3 pack boxed. Don’t forget that Hallmark will be unveiling thier ornaments tomorrow on the 17th. If you are getting this years ornaments and have not preordered, you may want to stop in your local store in the morning. Thanks to Vinny for the news. It seems KB Toys are doing the same as TRU. The figures being pulled there are Ric Ollie, Senator Palpatine, Padme Naberrie, Darth Sidious and Watto. If you liked the R2-MaulToo Custom I posted about a couple of weeks back, then you’ll love these! From the same guy, Harry Toor, comesWicket Fett, Ewok Trooper, 3P-Maul, and the return of R2-MaulToo. If you are interested in these, I’m pretty sure Harry has them on eBay from time-to-time, but you can e-mail him at briareos76@hotmail.com. Don’t forget that today Nintendo and LucasArts will be announcing how to be the Naboo Fighter in Rogue Squadron (PC and Nin 64). Here is the lowdown on what the deal is with the mini Ep I figs. Thanks to mr. anonymous for the news. Toys R Us in Springfield has the Maul sabers and they have a little bubble that said “With battery protector.” That means that the safe ones are out in Ohio. Thanks to Joe for the update. No need to worry if this happens to you! Simply call 1-800-TRUE-FAN and tell them what happened to you. You should be directed onto customer service where they ask you to send it back via UPS, and then they’ll repay you for the shipping costs and send you a replacement set. This happened to me with the Episode 1 Poster B and I got a mint one a few weeks later! The first reports of the Skiff Guards being found in the US have come in. We’ve recieved reports of the Skiff Guards being found at Shopko in WI and Idaho. Thanks to Richard and Aaron for the news. Thanks to Jason for sending in this VERY helpful news. If you had a problem with a KB Online Order, simply go to their Customer Satisfaction page and follow the directions. Hopefully you’ll be able to get what you truely want. Thanks to Chuck for the following info. Billy wrote in to say his local Taco Bell is now giving away Cup Toppers instead of toys in their kid meals since they are now out of toys. Thanks to all who sent this news in. The Ree Yees/Death Star Trooper 2-Packs from the Fan Club are showing up now, and to the dissapointment of anyone still trying to cash in on these “rare” figures, they are .00 invidually carded with slide, just like the ones that were in stores. They come with two action stands, and some other suprises like a Young Jedi Sample Deck and a Mace Windu action figure, depending on your order. If you’re out browsing the web today and are wondering about Star Wars Trading Cards, be sure to stop by StarWarsCards.net. It’s a nice site with a price guide, store, and much more! Amazon.com has now opened a Toy and Game section that is carrying such items for Tarpals, OOM-9, Ody Mandrell, Mace Windu, and some other hard-to find figures for $7.99 each. I’ve also recieved news from Jason saying that the Darth Maul with Sith Speeder is available there for a nice $6.99 plus shipping, and the Beru wave for only $5.99 each plus shipping! It appears the removing of low selling figs off the pegs is only happening at TRU. I went to my local TRU today and the bins and pegs went from overflowing to half full in 2 days. But, at Target and other stores there were still plenty of Ric Olies, Palpatine, and others. So don’t go paying insane prices for these figures there are still lots out there. Thanks to Patrick for the follwing news. “Hasbro is in the process of “recalling” three current figures becasue of low sells and high inventory. The three figures are Ric Olie, Senator Palpatine, Padme Naberrie. The TRU I work at only kept thirty of each figure. Could this be happening all over the country? Only time will tell. Here is your first look at the carded Adi Gallia! Click a following link to see each side of her. Front/Back. ServiceMerchandise.com has the 12″ Hoth Leia for a nice $7.92 each. Item # 57110KE. Thanks to Mark for the news. *Update 6:16 PM*: Seems that they increased the price to around $9.90 plus around $7-8 for shipping. In the end, it’s only about $2-3 cheaper than it is in stores. It looks like Hasbro is making some sort of mini Ep I line. Take a look at this pic of 2.5 inch Ep I figs from Hasbro. Thanks to everyone who sent this news in. KBToys.com (Now KBKids.com) has these Episode 1 figures for sale for only $2.95 plus free shipping! C-3PO, Darth Sidious, Jar Jar Binks, Queen Amidala (Naboo), Ric Olie, Senator Palpatine, Obi-Wan Kenobi (Jedi Duel), Chancellor Valorum, Watto, Qui-Gon Jinn (Jedi Duel), Padme Naberrie. “They are offering 4 SW Limited Edition character posters when you buy two 12 packs or one 24 pack of Pepsi, DP, P1 or MD AND 5 oz. or larger bag of Lay’s Brand Potato Chips or Doritos brand Tortilla Chips. Thanks to Joe for sending in a scan of the Lego Yoda you can win from Target. Check the scan for details on the contest. Jon sent in some information on his discovery of the new Interactive Yoda Furby toy, and about making reservations for one at certain stores. He told us to pass along that you shouldn’t ask for a “Yoda Furby” but an “Interactive Yoda.” They’re made by the same company that makes Furby’s, but that’s not what they’re called. After a long delay, I have started working on YakVision once again. I have posted 7 new cards from The Phantom Menace. Please click on the link on the menu and check them out. Send me some feedback if you wish. Now I ask, would you really seeing this guy in your house all day? Please resend any email to vintageman, his email has been corrupted, if you have emailed him in the past month, please resend. I should be working at Target soon, so I’ll see if there is any more information available. Go here to see pics of the Epic Force Maul and OB-1 boxed. Admiral Motti, Princess Leia with Hood Up, New Super-Articulated Stormtrooper (Only Small Picture Available Currently), Watto’s Box Cinema Scene 3-Pack, Rappel Line Attack, Pod Refuel Station, Hyper-Drive Repare Kit, Tatooine Disguise Kit, Naboo Starfighter shooting game, Chewbacca with Millenium Falcon gameboard and holographic game pieces, Wuher, Qui-Gon Jinn with Lightsaber on an Eopie, plus more we’ll add later! In case you missed it at New Hasbro site on the product list the last two items are: Skiff w Luke Skywalker (1/2000) and Y-Wing w pilot (6/2000) WOOHOO! Click here to go to the brand new Hasbro site to see TONS of new pics. Including the new Stormtrooper (available Sept 99), Admiral Motti (Jan 2000), and tons and tons more. GO NOW!!! Servers servers servers……. Servers make the net go round I tell ya. As many have seen, and have asked about, we have moved servers. All of our URL’s [http://www.yakface.com, http://www.yakfacesrealm.com, and our new one http://collectibles.echostation.com] point to one single IP address. So no matter which one you use you will eventually end up at http://collectibles.echostation.com. This will always remain Yakface’s Realm and we have not been bought out or whatever the latest rumor is. We have formed an alliance with EchoStation.com, becoming their representation in the Star Wars community for collecting. EchoStation will be launching a new look soon and we will be listed in their menu as the option for collecting. We hope this new alliance will better serve more collectors, and fans worldwide plus benefit both websites. If you are currently looking for a webhosting service, might I suggest NovaTech Web Services, which hosts our website as well as EchoStation.com. Sean Hambly got the new Lego catalog in the mail today and it contains some interesting Episode 1 items. First are Lego keychains which are $4 each. Click here to see an image of them. Second is the Droid Developer Kit, which contains all 3 Mindstorms Droid kits. The due date is August 27 and the price is $109 (item #9748). Click here to see the Kit. – The Sith should not be ignored. – The power of the dark side is growing, I fear. – There is more to this conflict than meets the eye. Pez Central has pics of the new Jar-Jar pez that is coming out. Thanks to JawaPez for the news. – Adi Gallia comes w three sayings on her Comm Tech chip, none were in the movie. Barnesandnoble.com is taking pre-orders for the new Masterpiece C-3P0 set. It comes with a book and 12″ figure. The figure is C-3P0 w/cargo net. He has removable limbs very similar to the 3 3/4 fig. It is due out in September. Thanks to Marcus for the news. Need to get your collection organized? Well then you need to try Davids Collectors Companion! This program looks pretty sweet I must say! Check it out today! Davids Collectors Companion demo is available athttp://www.caseclosedgame.com/collector. Mos Espa has Wave 5, minus the Destroyer Droid, in stock. Better hurry. Go here if you want to see pics of the new Ep I wind up toys. The new ones include, Queen Amidala, Battle droids and a gold Darth Maul. There have been several reports of Anakin (Naboo) showing up but still no pictures of the figure to back it up. So it appears it may be out but it is still not confirmed. Go here to see the new Anakin w cockpit figure. The picture is from the new issue of Tomart’s. Wal-Marts are now getting shippments of Wave 5 (Yoda wave). Thanks to Ed for the news. This is the Action Collection C-3PO that is the continuation of the Action Collection Anakin Skywalker with the book “The Story of Darth Vader” by Steve Sansweet. Glad to see it’s finally coming out. Toy Maniacs.com (The URL is right this time) has these figures in stock right now: Ree Yees ($29.99), Yoda ($11.99), Nute Gunray, Rune Haako, R2 D2, Destroyer Droid, Qui Gon Jinn (Naboo), Obi Wan Kenobi (Naboo), Jabba’s Dancers ($24.99). Thanks to Gasgano for the news. I recieved an e-mail about this, and then I saw it on TV myself. There is a Pizza Hut commercial promoting the cup toppers for a lower price of $2.99. So it’s a chain-wide discount, not just a local thing. The Taco Bell topper deal still seems to be a local sale. Yakface is pleased to announce that we have moved servers and are now on the EchoStation.com webserver. We are now part of Echostation as their collectibles site. We will continue to provide daily updates with ALL the latest news. I have a set of 6 of these, they include Nute, Watto, Jar Jar, Ben, Qui and Darth Maul. You can see the image here. The set shipped is $120. Let me know if you are interested. These normally sell for $27 or more for each. I only have one set. Check out shop.starwars.com for her. She is in stock. Just in case you missed it, TPM became the 4th highest grossing film of all time this week by overtaking Jurrasic Park. Next in line for TPM is that Reese’s Pieces eatin freak E.T. GO TPM! 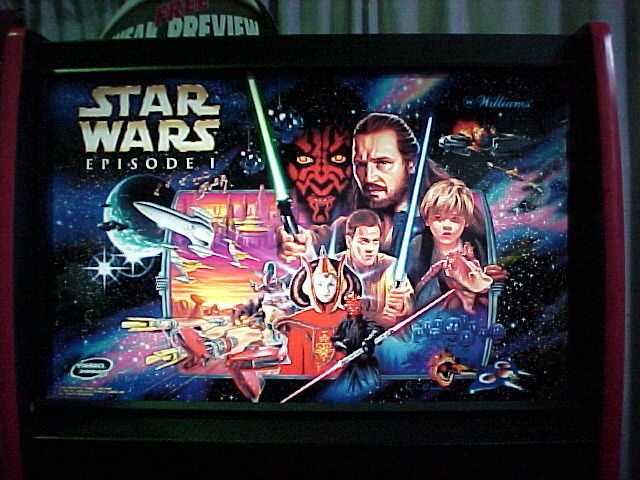 There is also a demo video of the software athttp://www.lucasarts.com/products/episode1guide. Here ya go folks the first ever pics of the Classic Han Solo and Classic Greedo carded. If you want to see Luke, Power Droid or R2 head on over to Outer Rim. 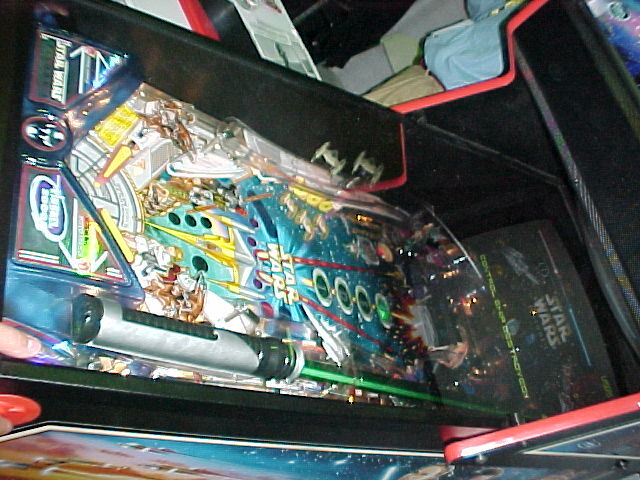 Our hosted site, “The Emulator Strikes Back” has been experiencing some minor problems and bugs, but they have all been fixed and welcome your visits. Phillip is reporting that the Ep I sounctrack will cost $11.99 and most likely be only one CD. I was hoping for 2 but as long as everything is on that CD I guess it’s better. Thanks to Kevin for the news. In case you missed the 60 Minutes segment TheForce.net has combined all the clips from the movie into one quicktime file and called it Trailer C.
Some Wal-Marts have begun to mark their shelves for Ep I legos. Some of the legos already being listed were: The Jedi Duel, Anakin’s pod, Naboo swamp and the Naboo fighter. Prices ranged from $5.99 to $19.99 Thanks to Jeff for the news. LucasArts’ Episode I pod racer computer/video game is coming for Mac OS, in addition to the computing/gaming platforms reported previously. (Source: http://www.lucasarts.com/) This will be the first LucasArts game for the Macintosh in quite some time (the recent hybrid DroidWorks being a Lucas Learning product). New Ep I poster arriving!! SW Celebration tickets shipping soon? Here are some links to magazine sites that contain Ep 1 Info. Thanks to mr Fett for the news. These have all posted news, pictures, and insights to the video games based on The Phantom Menace For the P.C., PlayStation and Nintendo64 All look very promising !!!! Here is something that has been on my mind about all the hoopla going on around the toys. There seems to be a lot of people that say these toys are going to be hard to find. This is what I have found out from talking to various Retail Stores around my area in Michigan. These would include TRU, Meijer, KB, Target and Kmart. All of these store managers have told me that they will have full isles on May 3rd, with more in the back room. Collectors everywhere, THERE is no rush to pre-order. You will be able to get what you want. If any of you remember what Godzilla day was like, it will be that times 10. You will be able to go into any store that sells toys and find something. just my thought on that. No Advanced Tickets for Episode 1! The official site has updated with info concerning advanced ticket sales: “Although this issue is still being discussed, we believe the best way to make tickets available, to be fair to all of you, is on a same day – first come, first serve basis for the first two weeks. Our biggest fear is that if we sell tickets in advance, scalping will take place and you and your families would either not be able to get tickets or would have to pay above face value. We feel this is totally out of line with our concept of the Star Wars experience. Tickets would go on sale each morning for that day’s performance. After the first two weeks we would allow advance sales. We understand and regret that waiting in line may cause some inconvenience, but we feel scalping or auctioning off of tickets would create a greater disservice to families and fans.” Click here to view the entire article, which also discusses digital sound in theatres. The $100 mothership coming out is definitely the Queen’s silver chrome J-327 starfighter, not the Federation battleship and it DOES come with a red astromech droid there’s a pic of him on TFN from the new Insider the Red droid is Ric Olie’s personal droid I believe his name is R2-A6 I think…..
Obi-Wan #2 and Qui-Gon #2 are both in brown robes, Queen #2 is in her Naboo red dress, Anakin #2 is wearing Obi’s hair braid (from the end ceremony), and Maul #2 has a plastic cloak with the hood down. Thanks to Ed for the news. Thanks to Dave for more great K-B news. “Episode I stuff we’ll be receiving at my K-B a week and a half from now. I’ve gotten a couple more interesting tidbits that excited me a bit and show just how big this thing’s gonna be. -Those 200 cases are almost all peg items. So that’s mostly just figures and carded accessories! Imagine all the other things we’ll get! -Our Kay-Bee, and I assume most others are going to have to move all our action figures(one side of an entire aisle) and replace the whole area with Episode I stuff! Thanks to Aaron for the Target news. This news comes from Jon. Here is the assortment info concerning the Beru wave. JediJimmie’s has moved to a new host site, Jedinet. His new site can be found by clicking the link above. Yakface’s Realm is proud to be hosting The Tusken Trader! Here is an overview of what is in the Vogue article. Thanks to Shawn for the info. According to a KB employee they have just been informed that they will be recieving 200 CASES of EP I merchandise for May 3rd for just this one store. Given KB usually small SW section compared to other stores finding any EP I product should be a piece of cake. X-Wing Alliance Demo Now Available! Theforce.net reports William “Porkins” Hootkins will make his first convention appearance ever at the Sci-Fi Expo in Plano, Texas! This is a definate must see for Porkins fans! Click here to visit the official SciFi Expo website. Entertainment Weekly’s website has posted some of the pics from their new Star Wars cover story in the new issue. On the cover of the new issue is a new pic of Obi Wan Kenobi in action. I would still advise picking up the issue since the website has not posted all the pics in the new issue. Click here to see the pics. The Official Star Wars site has updated with part 2 of their 5 part series, “The Weapons of Episode 1.” The weapon featured in part 2: The Queen’s Blaster Pistol. This info is from Jen at hasbro. Popular Mechanics has announced a special Star Wars: Episode 1 issue called “The Machines of Episode 1.” It is expected to go on sale on May 11th. Applause has updated their site with a list of general Star Wars merchandise from Episode 1. All Episode 1 merchandise from Applause will go on sale May 3rd. Click here to check it out. We recieved a report that the Beru wave has been found in Chicago and there are reports of the Beru wave also showing up in an Electronic Boutique in Portland. Thanks to Adam for this news. This info comes from the Best Buy PC. Thanks to Inkabel for this news. He emailed this to me. “I was at the 3rd International Toy Expo where the C-3PO pic was taken. I talked to on of the Hasbro Direct Reps there and THEY stated that this was indeed part of a book/figure deal like the Anakin Masterpiece set.”. Rebelscum.com has added some great new pics of the Beru wave andFandomMenace.com has posted tons of REAL pics of EP I figs loose. George Lucas announced at the ShoWest convention in Las Vegas on March 10 that digital projection of Star Wars: Episode I The Phantom Menace will take place on four screens beginning June 18, 1999. This will be the first public demonstration of a full-length motion picture from a major studio using digital electronic projectors in movie theatres to replace the normal film projectors. There are 4 new pez dispensers posted over at Rebelscum.com. Apple announced today that over one million copies of the “Star Wars: Episode l – The Phantom Menace” trailer have been downloaded during the first 24 hours from the joint Lucasfilm/Apple Website hosted by Apple (www.starwars.com or www.apple.com). The trailer premiered on the Internet yesterday morning, and is available on the Internet exclusively in QuickTime. In the same 24 hours, over 600,000 copies of Apple’s QuickTime, Apple’s industry-leading digital multimedia platform, were downloaded. For cool toy inserts, blueprints, instructions & sticker sheets from both vintage and the new POTF2 lineup please visit the Star Wars Insert Guide. I am currently an employee of Toys ‘R’ Us. I had some free time today on my shift and went through the computer system and found some Episode 1 stuff. Included is a list of some items of interests to collectors and other stuff to show the deluge of products we will all see in the next few months. There’s a bunch of stuff I left out, including numerous Tiger Elec. games. I also looked up the new Classic 12″ figures that are coming out (skn# 464511) and found something else. Underneath was 12″ Classic 2 (skn#756156) I guess the Ceremonial Leia is in that but as far as that I don’t know. I just thought I’d let you guys at the realm know I just purchased an amazing book called “Star Wars – The Action Figure Archive”. It’s mainly written by sw toy guru steven sansweet.I didn’t see any mention of this on your site. All I have to say,is that when you look thru this book your jaw will hit the floor. It’s a sw figure collectors dream. I bought mine for just under $24.00 at barnes&noble.com. It’s the best $24.00 dollars any sw figure collector of the vintage line or the new line (1995 – 98) will ever spend. It’s the true sw toy bible. OK Game fans, head over to your local Toys R us, Some stores are starting to pre-order the new Pod Racer game for a $10 deposit. Expected date is 7/28/99 and the final price is $49.99. Thanks to Chris for the info. Star Wars Release Date MOVED UP!! The Star Wars Release date has been OFFICIALLY moved to the 19th of May. This is also shown on the end of the new trailer. They have updated with the new poster, and the trailers. Tiger Electronics is making a Yoda Furby. This is to ship sometime in July. Well…. Countingdown.com does not have the trailer and will not post anything until after Starwars.com does this friday. However it is supposed to be on ET this wed. However ASWN is reporting that it possibly has been pushed back to thurs. nite or fri nite as well. We will have to wait and see…..
Also, Starwars.com has posted this little tid-bit on the new trailer. The New Episode I Trailer! March 8, 1999 — www.starwars.com is pleased to announce that the new trailer for Star Wars: Episode I The Phantom Menace will begin showing in theaters across the U.S. and Canada this Friday, March 12th. With all new footage the trailer introduces the characters and conflict of Episode I, and features glimpses of some of the fabulous environments in which the action takes place. The new trailer will be placed into general release, running on a wide variety of films over the coming weeks. Contrary to speculation, it will not be attached to any particular film, including Wing Commander, and in fact may not even play with Wing Commander. There is no assurance the trailer will play with any particular movie and you will need to contact your local theater for information on where the trailer will run in your area. Jason S spoke with a Customer Service Rep at the Fan Club and he was informed that the EXPECTED date for the figures to be in will be in June. Thanks for the news. Meijer’s Has begun to sell the Star Wars Lego’s. I found them last night at a local store here in the Detroit area. The second series of Manga Star Wars:Empire Strike Back is now out at your local comic book store. This issue will have Luke when he meets Jedi Master Yoda and begins his training in the ways of the force. Check your local comic shop. In an upcoming episode of That 70’s show the plot will deal with the cast of teens viewing Star Wars for the first time. We all know now that the new trailer for Episode 1 will be released to theatres March 12th along with Wing Commander: The Movie, but the trailer will be shown before that date on TV. Entertainment Tonight and a couple other news programs are expected to premiere the trailer on Wednesday that same week. Look for the official site to post the trailer on the site a couple days after its theatrical release. The latest wave of Action Collection 12″ dolls have been found at a Toys ‘R’ Us in Indiana. The new wave includes Ponda Baba, Ben Kenobi with training ball, and Luke Skywalker in Stormtrooper disguise with dianoga tail. There are 2 of each doll per case and the Toys R Us SKU # is 464-511. Thanks to ed for the info. The fan club has stopped taking orders for the Fan Club exclusive figures as of Monday, March 4. If you haven’t ordered them yet, dont worry, the figures WILL be available again sometime in April after all the previously ordered figures have been shipped out. Thanks to Mike and “Oola5” for the info. Every 2-3 weeks a new can design will be available Look for these Chronicle Cans in 12 and 24 Packs of PEPSI. (This text is next to a picture of a can with Chancellor Valorum) COLLECT ALL 24 CANS throughout the summer Please empty Collector Cans before saving. This can is one of the four can designs available on Pepsi One and may not be the one inside this carton. One can design per carton. The new Hallmark catalogue is out and it has some new Star Wars items listed in it. Featured in it are ornaments of Han Solo, Chewbacca, TIE Fighter, Max Rebo Band, and an Episode 1 character and ship. There are no pictures or names listed for the Episode 1 stuff. I am assuming these are all ornaments to be released this Winter. Confirmed Don Post masks include Darth Maul, Watto and Queen Amidala. Look for tons of masks to be released from Episode 1 this Summer. More info to be revealed in a couple weeks. Thanks to “buymetoys” for the tip. Rebelscum.com has posted an image of the exclusive Epic Force 3 pack (Han Solo, Chewbacca, Ben Kenobi) from FAO Schwarz. Surprisingly, all three come in a single window box. Check out the site for the scan. On a side note, more of these in their normal packaging have been spotted at Shopko stores at retail prices. The Darth Vader chrome cards are not only coming with shipments of the fan club 4 figures, they are also being included with Mynock Hunts ordered from the fan club. Thanks for “Kimundi” for the tip. Here is some info sent to us from Kevin regarding the shipping of the Fan Club figures. Thanks to Bryan for the news. Thanks to Matt for the news on the Fan Club 4 figs. We have been getting many reports of orders for Blastwave and Mothma figures ordrs being cancelled. There is a good chance that this is due to a computer error. TheForce.net is reporting that some orders were lost due to a computer error so there is a good chance that the ordrs were cancelled due to a computer error. I advise if you ordered them to check on your order and if your order was cancelled to try and reorder it. Rumors have been flying around the web that stores like TRU have recieved their shipments of Ep I figures and have now put them into storage until May. Also, rumors of Ep I figs being sold or leaking out of TRU’s are being reported. Which I find very hard to believe since TRU is such an uncorrupt store. These are all rumors and have not been confirmed. Thanks to various sources for the info. We have recieved a report that Mos Espa has cancelled someone’s order for some of the BS and Mothma wave figs. Could it be that they let people order more figures than available? Thanks to Leif for the news. There is now a Mindstorm r2-d2 video. You need Real Player to watch it. Thanks to Stone for the info. Yakface.com (and its staff) may receive compensation in the form of money, product and/or discounts for promoting certain advertisers, affiliates and store fronts via this website and/or through social media. In order to provide full disclosure and transparency to our visitors, and comply with required Federal Trade Commission (FTC) guidelines, all links presented on Yakface.com to partnered advertisers, affiliates and store fronts will be clearly tagged with but not limited to “Sponsor News” and/or “Sponsor/Affiliate News”.